The title of this interactive installation, Teleporting an Unknown State, is borrowed from the first scientific paper ever published on the subject of teleportation. The installation takes the idea of teleportation of particles (and not of matter) out of its scientific context and trans­poses it to the domain of social interaction enabled by the Internet. Following my previous work with telematic interactive installation and my exploration of non-semiologi­cal forms of communication with electronic media, this new installation uses remote trans­mission of video images not for their representational content but for their optical phenom­enon as wavefronts of light. Internet videoconferencing is used to teleport light particles from several countries with the sole purpose of enabling real biological life and growth at the installation site. A new sense of community and collective responsibility emerges from this context without the exchange of a single verbal message. This piece connects a physical gallery to the placeless space of the Internet. 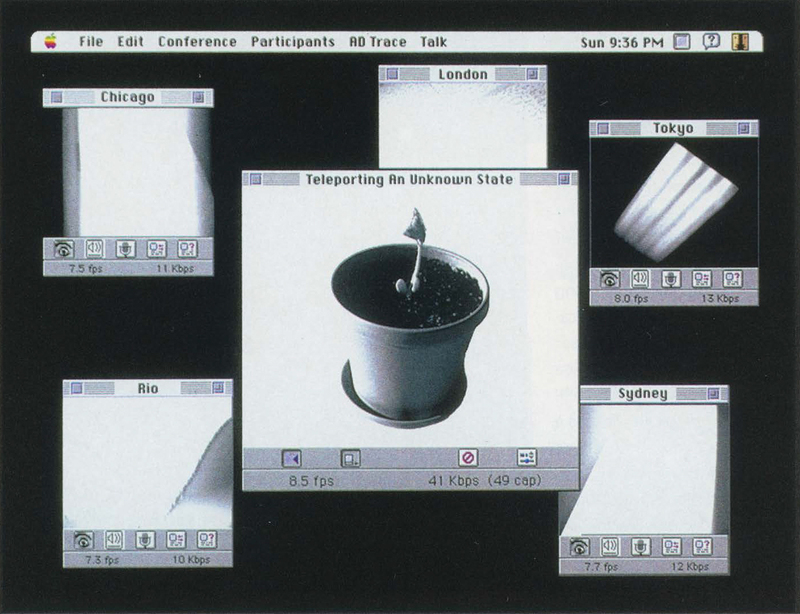 In the gallery, the viewer sees an installation: a monitor hangs from the ceiling and faces a pedestal, where a single seed lays on a bed of earth. At remote sites around the world, anonymous individ­uals point their digital cameras to the sky and transmit sunlight to the gallery. The photons captured by cameras at the remote sites are re­emitted through the monitor in the gallery. The video images transmitted from the interna­tional sites are stripped of any representational value and used as conveyors of actual wavefronts of light. The slow process of growth of the plant is transmitted live to the world over the Internet as long as the exhibition is running. All the participants are able to see the process of growth. Through the collaborative action of individuals around the world, photons from distant countries and cities are teleported into the gallery and are used to give birth to a small and fragile plant. It is the par­ticipants’ shared responsibility that ensures the plant’s growth as long as the show is open. This piece operates on a dramatic reversal of the regu­lated unidirectional model imposed by broadcasting standards and the communica­tions industry. Rather than transmitting a specific message from one point to many passive receivers, Teleporting an Unknown State creates a new situation in which several individuals around the world transmit light to a single point in the New Orleans Contemporary Arts Center. The ethics of Internet ecology and social network survival are made evident in a dispersed and collaborative effort.